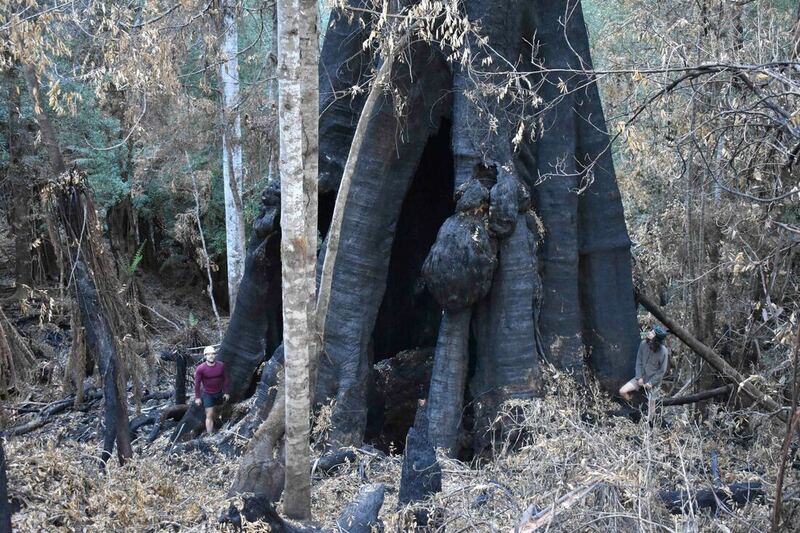 The Tasmanian bushfires that started with dry lightning strikes on January 15th and burned for weeks have had a devastating effect on most of the 500 year old giant trees that lived in the Southern Forests, inland from Geeveston. Very old eucalyptus trees are particularly susceptible to fire due to their various hollows, areas of rot and the accumulated debris of centuries of fallen limbs, twigs, bark and leaves. Most of these older trees have been killed, including some that have totally collapsed into an incomprehensible mess. Some of the living trees cling to life standing on blackened stilts, probably likely to fall when the next big wind storm hits. A lucky few have escaped with only a surface burn and could live for many years. A list of some of the assessed trees is included below, however, there were many trees that I was unable to access due to ongoing road safety works in those areas. Eucalypts. 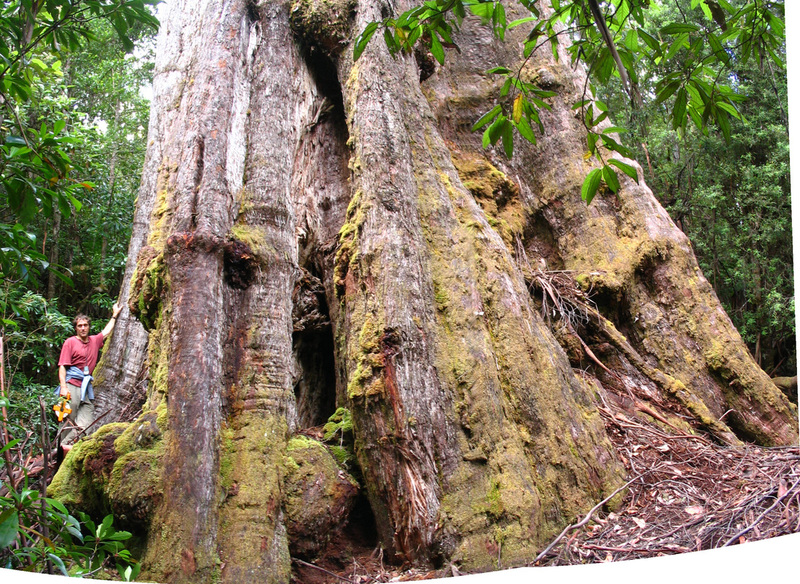 In fact Tasmania is the home to Australia's largest and tallest trees with individual specimens towering up to 100m tall and ancient monsters bulging to over 21m in girth. While most of these giants are Eucalyptus regnans, (known locally as Swamp Gum or mountain ash if you are in Victoria). Eucalyptus globulus - Blue Gum, Eucalyptus viminalis - White gum or Manna gum, Euclayptus delegatensis - gum topped Stringybark, and Eucalyptus obliqua - Stringybark, are all known to have produced trees that exceed 85m in height. There are a number of regions where you can easily see giant eucalypts: The Styx Valley, The Florentine and Upper Derwent, The Huon and Arve valleys and the North East forests.